I am a geoinformation scientist and work at the University of Warwick, where I conduct research on spatial and platial analysis methods. In addition to this, I am affiliated with the GIScience research group at Heidelberg University. I teach spatial analysis and GIS courses at graduate and undergraduate level. My background is geoinformatics with a Ph.D. from Heidelberg University and a Master’s degree obtained at the Department of Mathematics and Computer Science at the University of Osnabrück. 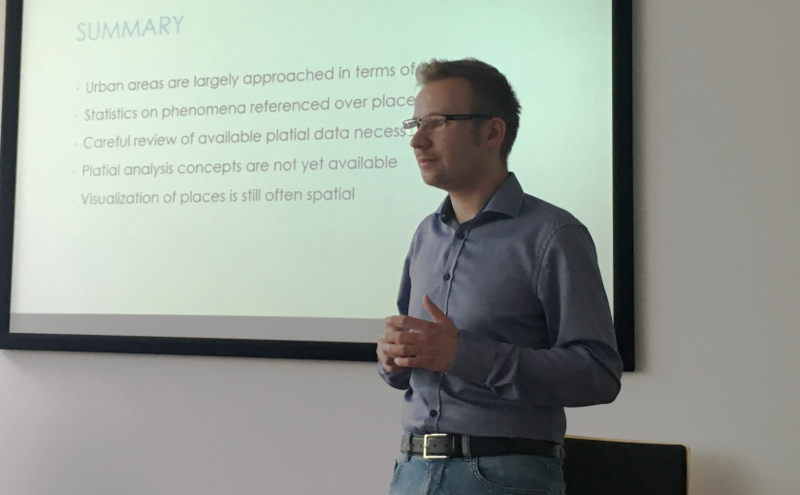 During my Ph.D. studies I have worked on the spatial analysis of geosocial media data. My current methodological research continues this work and deals with the estimation of spatial autocorrelation based on user-generated content. I also explore how we can shift the focus of quantitative analysis from space to place—the latter being the relevant unit used by people to experience the world. This work has been part of a DFG priority programme for the spatio-temporal analysis of volunteered geographic information, and is continued in my current assistant professorship. In addition to my enthusiasm for space and place, my practical experience includes several years of interdisciplinary activities in software development in nature conservation and agricultural projects, along with several smaller, independent software projects with external partners. I am professional member of the OGC, the Association for Geoinformatics, GeoIT and Navigation, and a fellow of the Royal Geographical Society in London.